Another week is upon us which means it is time to add another section to our Home Management Binder. The goal is to have the binder completed before Baby Cecilia gets here so each week I hope to add another piece to it. Once complete, we will put the whole thing together and have all of the templates in one easily accessible place. With the recent build of our master closet, I have clothes on the brain. Besides needing to purchase organizational boxes, wood hangers (ok, maybe not a need, but aren’t they just lovely? ), and baskets, Mr. P and I have also been going through (again!) our clothes to see what we really wear and what we don’t. At this point, it’s a little bit more difficult for me to figure out what is going to work and not work after Cecilia gets here. However, there are definitely some items that I just have to be honest with myself and say, “Seriously, you will never wear this again.” Whether too youthful or worn, some items can (and should) leave your wardrobe regardless of how much you like it. With that said, on to today’s template – the Family Apparel Guide. 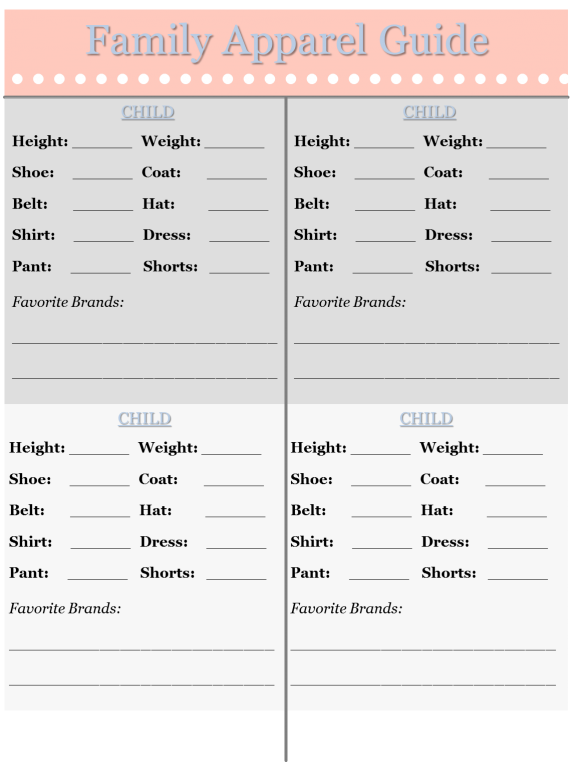 A family apparel guide is a quick and easy go-to spot that contains the clothing and accessory sizes for each member of your family. This is helpful both for you (if you are the primary apparel shopper) and for your spouse or children, especially around Christmas or birthdays. 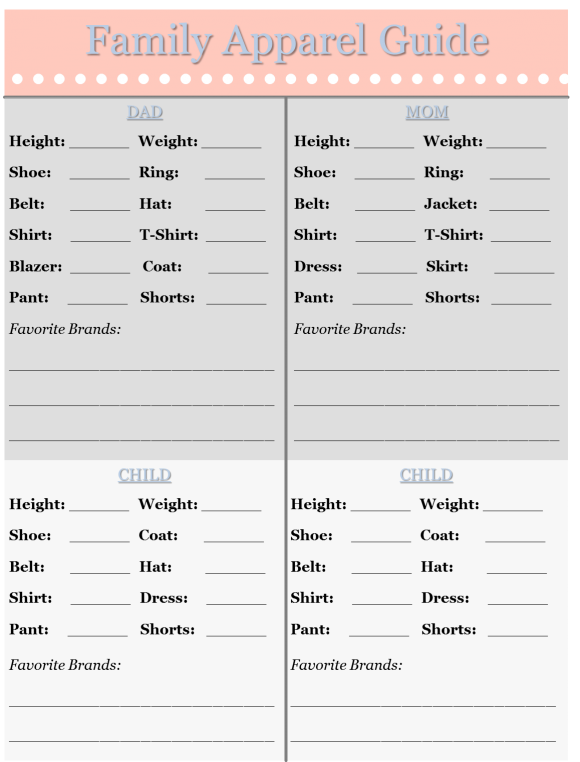 In general, the family apparel guide template (below) will work for most families needs, but you could easily tailor it if you please. Since Mr. P has a job where he has to dress in professional attire most of the week, our family apparel guide includes a size selection for blazers. If you or your spouse has a specific occupational need for clothing, you may want to include that as well. Either way, the point of a family apparel guide is so any person in the family can easily see the clothing size needs of the other members of the family. In our template below, the first sheet includes a section for mom, dad, and two children. If you have more than two children, there is another sheet below that has space for four additional children. Since clothing sizes can change over time, especially with children, this is a document that should be reviewed every six months to a year. Another aspect included at the bottom of each family member’s section is a spot for “favorite brands”. This is also something that tends to change over time. For our family apparel guide, I will most likely expand this section since we have a variety of “favorites”. As always, feel free to print this template out as is or use it as a guide to create your own! Happy home managing!